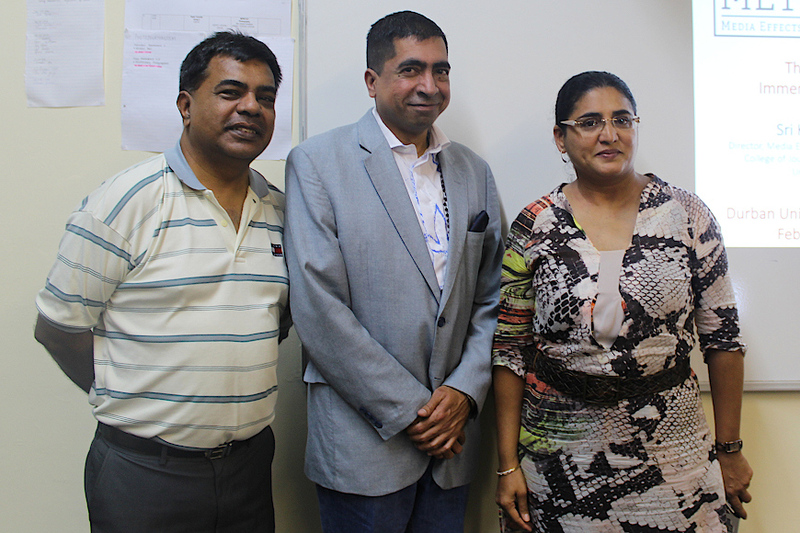 As part of its Radiocracy Roundtable series, the Durban University of Technology’s (DUT’s) Journalism Department hosted visiting Journalism Professor Sri Kalyanaraman, delivered his presentation on The Science of Immersive Storytelling, at City Campus, last Friday, 1 February 2019. Professor Kalyanaraman is based in the College of Journalism and Communications at the University of Florida where he is the Director of the Media Effects Laboratory which he had established. He was previously at the University of North Carolina’s School of Media and Journalism. His research looks at the psychology of new technologies, especially on how these technologies can influence the attitude change in online settings. At his current workplace, Prof Kalyanaraman has been instrumental in driving the importance of the media’s role on virtual reality. Prof Kalyanaraman’s research also looks at the role of virtual reality as a medium to assist the media in tellling stories and upholding the name of journalism and media as a whole. Prof Kalyanaraman spoke of the media effects laboratory which is paving the way in allowing humans to use virtual reality goggles and simulations to delve into issues such as oil spillages in the ocean in relations to ocean life like that of penguins and coral reefs. In his presentation, he spoke about immersive 360-degree videos which makes distant environmental threats feel closer, and more severe by absorbing you into the story,’’ said Prof Kalyanaraman. He also spoke of the usage of virtual reality to have an interactive encounter of washing virtual reality penguins that are facing issues of oil spillages to assist in changing the attitudes towards the story of environmental issues. This exercise, as Prof Kalyanaraman stated, allows those submerged into virtual reality to have first hand experience to the cause and the effects, which are the sub-topics for the media effects approach, allowing them to examine the message of the story, and make them more observant of their environment. Pictured: Journalism’s Advocate Robin Sewlal, Prof Sri Kalyanaraman and Head of the Journalism programme, Ayesha Mall, at the event.